Passion flower is an interesting plant that is known for its medicinal properties. Learn more about its values, safety and what is the best passion flower supplement available. Many herbal remedies are backed by historical claims of medicinal benefits. Passionflower has been used for centuries for nourishment and medicinal purposes. In the past decades, it has gained popularity as an alternative medicine for treating anxiety and other related health issues. Passion flower is the common name for Passiflora incarnata, or “maypop”. It is a climbing vine known for its medicinal properties and was first discovered in Peru by Spanish explorers in the 16th century. Here are what you can expect from this popular plant that has been widely used for centuries. Increases Relaxation – Passionflower contains flavonoids, a group of plant chemicals that increases the level of GABA in your brain. This helps to reduce the furious rate of activity your brain is going through and helps you relax eventually. Reduce Anxiety – A clinical study has shown that consuming passionflower extracts have a similar effect of oxazepam, a prescriptive medicine in treating anxiety. But what makes passionflower a better choice is the lack of side effects often associated with prescription drugs. Manage ADHD symptoms – Those who are suffering from ADHD, a form of brain disorder that increases hyperactivity, may find relief with passion flower supplements. 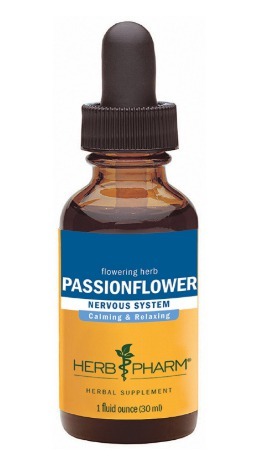 Passionflower supplements are usually available in capsules, extracts, tinctures or in dry flowers. Adults can take 0.5-1 ml of liquid extracts or 0.5 – 2 ml from the tincture. The difference between extracts and tinctures is that tinctures contain alcohol while extracts are made with either alcohol or glycerin. You can also steep dry flowers to make passionflower tea before bedtime. If you prefer taking passion flower capsules, do follow the recommended serving size suggested by the label. If you’re introducing passion flower supplement for your child, do consult your doctor for the right dosage. Passionflower generally safe to take in most circumstances. Its side effects are minimal, with rare cases of dizziness, nausea and drowsiness reported. Of course, you should take passionflower according to the dosage recommended. Prior To Surgery – You should avoid taking passion flower at least 2 weeks prior to surgery as it can decrease the activity in your brain. This can amplify the effect of the anesthetic. Antidepressant – Avoid taking passionflower extract with antidepressant and other sedatives as this could compound the effects on your nervous system. Babies – Passionflower is considered safe for children at 1/3 of the adult dosage. However, babies under 6 months old should not be given any passionflower extracts. There are literally hundreds of passion flower supplement in the market. You’ll want to be extra cautious when choosing the right passion flower supplement as it has potent medicinal properties. Here are what you need to consider before making a purchase. Various form of passion flower – Do you prefer taking capsules or drops of passion flower extracts? Or do you find sipping passionflower tea before bedtime a more enjoyable process? Non-GMO – Always check out that the passion flower extract that you’re buying is Non-GMO certified. This ensures that only pure passion flower is used in manufacturing. Other Ingredients – Most passion flower supplements contain a mixture of other herbal ingredients such as chamomile, and valerian roots. Make sure that you’re not allergic to any of the ingredients. Credible Manufacturer – Do not base your purchasing decision on price alone. As passion flower has a direct effect on your brain, you’ll want to get it from credible manufacturers with proven track records. Important: If you’re suffering from any medical conditions, you’re advised to consult your doctor before using these supplements. This article is not written by a medical professional, health expert or a doctor. Thus, it is not a substitute for medical diagnosis or treatment. It can be a painstaking process to choose the best passion flower supplement from the numerous brands and types in the market. 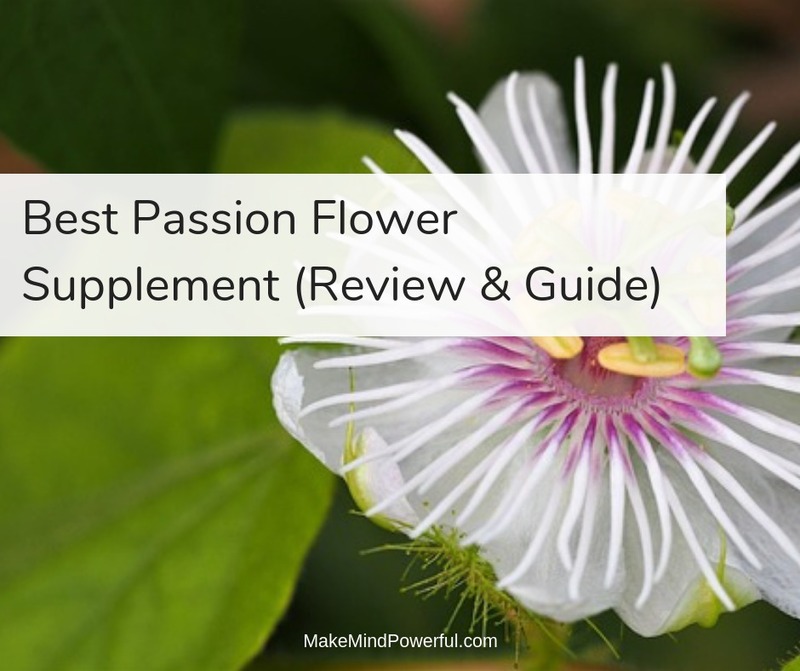 Therefore, I’ve compiled a list of passion flower supplements that are trusted by customers and produced by reputable manufacturers. 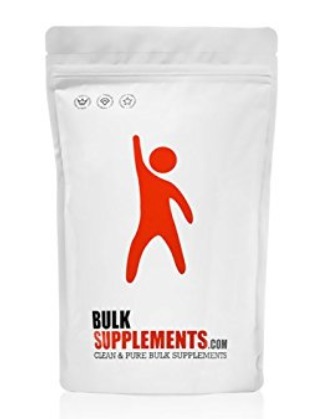 Based in Nevada, BulkSupplements is a major supplier of supplement products to hundreds of thousands of both consumers and manufacturers. The quality of its products is maintained at the highest standard in its FDA registered facility that complies to cGMP practice. Strict testings are also carried out to ensure the quality of the products is not compromised. This passion flower extract is shipped in a sealable pouch that helps you to store and preserve the powder. It is recommended that you take 1000 mg daily for your supplementary routine. You can mix it with hot water to make passion flower tea. Drinking it before bedtime will help calm your mind and promote better sleep. The supplement contains 10% of dextrin that functions as a water-soluble thickening agent. Besides calming your nerve, you can also take the mixture of passion flower extracts for improving cardiovascular health. It is tested in labs to ensure that you only receive pure passion flower powder. Lab tested pure passion flower powder. Some may find not feel the relaxing effect. Solaray was introduced as a flagship brand of Nutraceutical in 1973. Since then, it has grown to be a popular brand of health supplement products in wellness stores worldwide. It features a broad range of products and each of them undergoes rigorous testing for cGMP compliance. 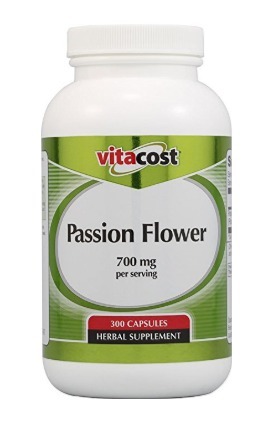 This bottle of passion flower supplement contains 60 capsules of 250mg extracts. They are made from various parts of passion flower plant that contains medicinal value. A single capsule is guaranteed to contain 3.5% of flavonoid, which provides a mild sedative effect to your brain. Taking a single capsule per day can help in reducing anxious thoughts. This is helpful when you’re feeling stressed up after a hectic day at work. It also helps if you’re suffering from insomnia as the properties of passion flower calm your mind down to sleep. Great in reducing anxious thoughts. Tested to comply with cGMP standard. Made from various parts of passion flower for maximum potency. The soothing effect can be less prominent for some people. In the early 90s, passionate nurse and farmer Randy met business-savvy Pam started Oregon’s Wild West to pursue their interest in traditional herbal medicine. They believe that providing the best herbal products only matters if the mother nature is well taken care of. 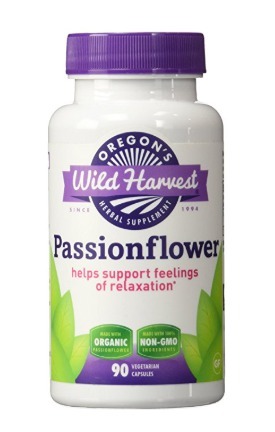 Each of the bottles of Oregon’s Wild Harvest passion flower supplement contains 90 capsules that last for 45 servings. They are certified to be organic and manufacturer to ensure the potency of passion flower is not compromised. Manufactured in the USA, these capsules will help you to soothe your mind when anxious. The ancient Aztecs have been using passion flower due to its medicinal properties. You’ll find that taking these supplements helps you to enjoy better sleep and also wake up feeling fresh. It also helps you to regulate blood pressure and prevent inflammatory diseases. Certified organic and 100% vegetarian capsule. Helps in getting deeper sleep. Not effective for some people. Established in 1968 as a family owned business, NOW Foods has grown leaps and bound since. Today, they are one of the recognized leaders in the natural supplement market. The company has implemented the highest quality practice in all aspects of the manufacturing process. Each of the 90 capsules in the bottle contains passion flower extracts with at least 3.5% of flavonoid. They are GMP certified to ensure you received the purest form of passion flower. With a suggested 2 capsules per serving, you’ll find that agitated mood will calm down. Unlike certain drugs, you can take passion flower for stress without worrying about developing dependencies. Passionflower can help people struggling with insomnia as the medicinal properties mildly sedate your brain. Apart from sleep disorders, you can also take passion flower after a good workout session in the gym. 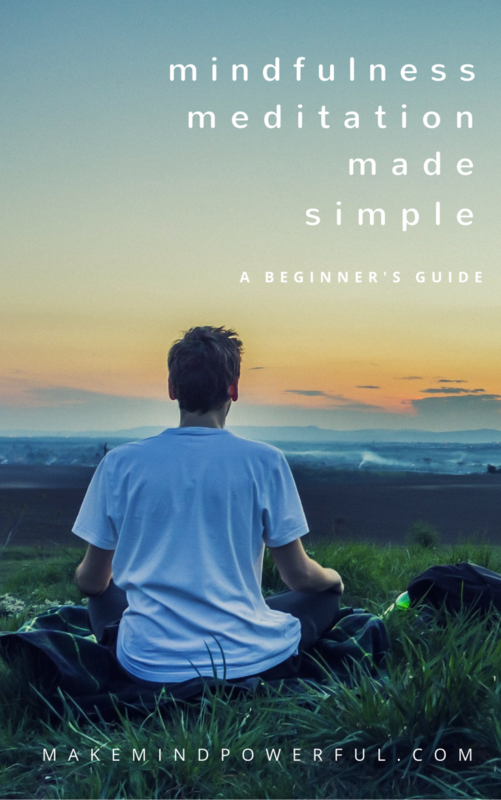 Helps to promote calm moods. Some barely find it effective. The founders of Herb Pharm believes in providing health supplements while preserving the soil they were harvested from. Each batch of the health products is made by hand and aided by the latest technologies. The herbs are sourced from their own farms or those that incorporate ethical practices. 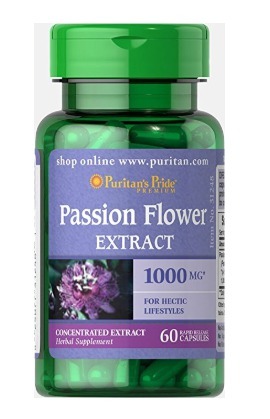 If you’re not a fan of swallowing capsule, this bottle of passion flower extract allows you to enjoy the same health benefits. They are made of organically grown passionflower and is both non-GMO and gluten-free. You’ll find that the liquid easily absorbs to your body and your mind relaxes. The recommended dosage for anxiety is 30-45 drops of liquid extracts. The liquid does have an earthy taste which may be overwhelming on its own. If you’re sensitive to that, you can mix it with fruit juices. Strong taste aside, it does help you to reduce anxiety to a certain degree. The taste can be unpleasant. As one of the oldest health supplement manufacturer in the US, Nature’s Answer has been producing top quality nutritional products since 1972. Its state of the art facilities and the latest scientific technologies ensure that the highest standards of production are observed at all time. 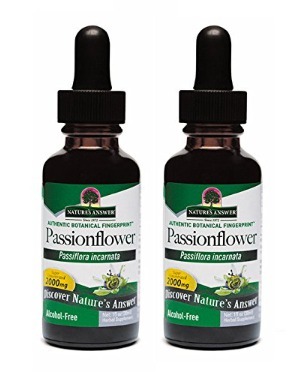 If you’re looking for alcohol-free passionflower liquid supplement, this pair of bottles may best suit your need. It is more economical compared to purchasing individual bottles. It contains gluten-free pure passion flower extract that will soothe your nerves. A single bottle contains 1 oz and that will make about 600 drops of passionflower liquid. It is recommended that you take 56 drops for supplementary routine. It helps to calm down your nerves after approximately 30 minutes of consumption. You’re likely to enjoy deeper sleep after taking this supplement. Economically priced for two bottles. Can leave a very strong taste. Botanic Choice has a history of more than 100 years of producing top quality nutritional supplements. What started as a humble farm has grown multiple folds into a trusted brand in the nutritional products industry. All the ingredients are sourced from trusted partners that are reputable in their respective fields. 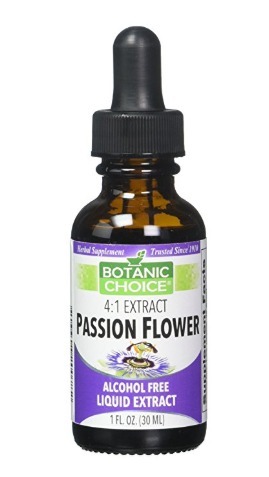 This bottle contains 1 oz of pure passion flower extract with non-alcohol base. It is recommended that you take 28-56 drops per day to enjoy the therapeutic properties of passion flower. You can either mix with drink water or fruit juice to take the supplement. If you’re having insomnia or keep waking up in the night, taking passion flower supplement before bedtime may solve your agony. It has the same calming property as the prescription drug but without the undesirable side effects. In liquid form, you’ll find the effect kicks in much faster than other forms. Effective in promoting better sleep. Vitacost boasts a great number of high-quality nutritional products in its offering. The standards are guaranteed in the strict manufacturing practice that complies with the cGMP standards. Since its founding in 1999, Vitacost has been committed to offering the best nutritional products at an affordable price. The capsules are made from the finest quality passion flower extracts and they are as pure and natural as you can get. 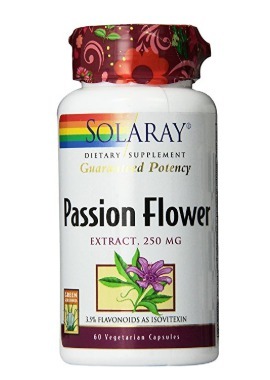 A single bottle contains 150 servings that deliver 700 mg of passion flower extract. 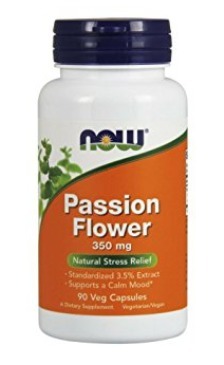 If you’ve been getting pretty restless, taking passion flower capsules on a daily basis will help. The flavonoids help to regulate and decrease anxious thoughts in your mind and promote calmer emotions. It’s perfect if are trying to unwind at the end of a stressful day. Furthermore, taking passion flower helps in improving other aspects of your health such as cardiovascular and inflammation issues. Helps in calming down the mind. Starwest Botanicals differentiated itself from other competitors with its superior herb quality during its starting years in the 1970s. Committed to delivering the best organic herbs to customers, Starwest Botanicals has established itself as one of the largest suppliers in the industry. 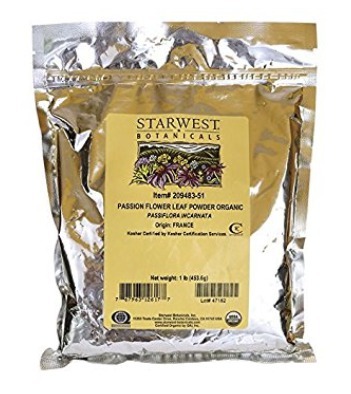 If you can forgo the fancy packaging of most passion flower supplement, this 1lb pouch of raw passionflower leaf powder is definitely a good buy. It is both organic and Kosher certified. You can make passion flower tea by mixing 1 teaspoon of powder with a cup of hot water. Drinking passion flower tea prior to bedtime will help you in getting better and deeper sleep. The mild sedative property of the plant will stop negative thoughts from flooding your mind. Besides that, you won’t suffer any side effects in the morning. Great for promoting deeper sleep. Need proper storage for preserving the powder. For more than 40 years, Puritan’s Pride has been the trusted supplier of supplements products. That’s because the company sourced only the best ingredients from around the world and ensure that the manufacturing process delivers the purest form of supplements to the customers. If you’re driven by a hectic lifestyle, taking the passion flower capsules will help you to seek the much-needed relaxation. The capsules from Puritan’s Pride are specially formulated to ensure the therapeutic properties are quickly released and absorbed by your body. You’ll feel that your mind naturally calms down as the effect of passion flower kicks in. It helps in getting into the deeper REM cycle of sleep and allow your mental energy to be replenished. You don’t feel any grogginess in the morning either when taking natural passion flower supplements. Effective to overcome sleep disorder. Some people may not feel the soothing effect. I hope that this list has helped you to narrow down your choice of passion flowers to the top brands in the market. If you are having good results with a brand that I’ve not covered, feel free to share your thoughts in the comment below.